People are often quite uncomfortable with change, for all sorts of understandable reasons. This can lead them to resist it and oppose it.This is why it’s important to understand how people are feeling as change proceeds, so that you can guide them through it and so that – in the end – they can accept it and support it. 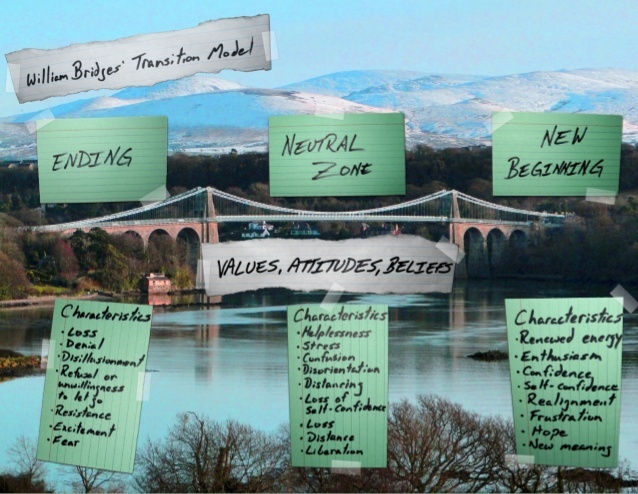 Bridges’ Transition Model is a helpful framework to think about transition. The main strength of the model is that it focuses on transition, not change. The difference between these is subtle but important. Change is something that happens to people, even if they don’t agree with it. Transition, on the other hand, is internal: it’s what happens in people’s minds as they go through change. Change can happen very quickly, while transition usually occurs more slowly. Ending, Losing, and Letting Go. Bridges says that people will go through each stage at their own pace. For example, those who are comfortable with the change will likely move ahead to stage three quickly, while others will linger at stages one or two. 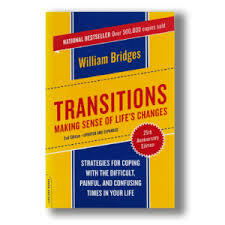 People enter this initial stage of transition when you first present them with change. This stage is often marked with resistance and emotional upheaval, because people are being forced to let go of something that they are comfortable with. People have to accept that something is ending before they can begin to accept the new idea. If you don’t acknowledge the emotions that people are going through, you’ll likely encounter resistance throughout the entire change process. It’s important to accept people’s resistance, and understand their emotions. Allow them time to accept the change and let go, and try to get everyone to talk about what they’re feeling. In these conversations, make sure that you listen empathically and communicate openly about what’s going to happen. Emphasise how people will be able to apply their skills, experience, and knowledge once you’ve implemented the change. Explain how you’ll give them what they need (for instance, training and resources) to work effectively in the new environment. People often fear what they don’t understand, so the more you can educate them about a positive future, and communicate how their knowledge and skills are an essential part of getting there, the likelier they are to move on to the next stage. In this stage, people affected by the change are often confused, uncertain, and impatient. Depending on how well you’re managing the change, they may also experience a higher workload as they get used to new systems and new ways of working. Think of this phase as the bridge between the old and the new; in some ways, people will still be attached to the old, while they are also trying to adapt to the new. • Resentment towards the change initiative. • Low morale and low productivity. • Anxiety about their role, status or identity. • Scepticism about the change initiative. Despite these, this stage can also be one of great creativity, innovation, and renewal. This is a great time to encourage people to try new ways of thinking or working. Your guidance is incredibly important as people go through this neutral period. This can be an uncomfortable time, because it can seem unproductive, and it can seem that little progress is being made. Because people might feel a bit lost, provide them with a solid sense of direction. Remind them of team goals, and encourage them to talk about what they’re feeling. Meet with your people frequently to give feedback on how they’re performing, especially with regard to change. It’s also important to set short-term goals during this stage, so that people can experience some quick wins ; this will help to improve motivation as well as giving everyone a positive perception of the change effort. 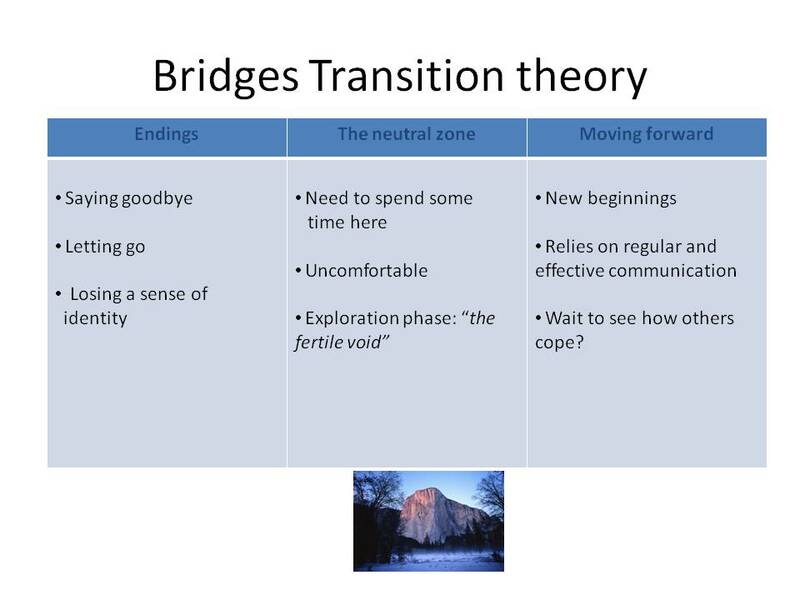 The last transition stage is a time of acceptance and energy. People have begun to embrace the change initiative. They’re building the skills they need to work successfully in the new way, and they’re starting to see early wins from their efforts. As people begin to adopt the change, it’s essential that you help them sustain it. Use techniques like Management by Objectives to link people’s personal goals to the long-term objectives of the organization, and regularly highlight stories of success brought about by the change. Take time to celebrate the change you’ve all gone through, and reward your team for all their hard work. However, don’t become too complacent – remember that not everyone will reach this stage at the same time, and also remember that people can slip back to previous stages if they think that the change isn’t working.